[Schwabenkrieg] Supposita pictura regie maiestatis Helvetiorumque conflictum insinuat quo quisque loco victoria positus sit terga prebuerit hosti oculari demonstratione in qua quicque Helvetiorum loco S. Lra. ppnoitur. Reproduktion der Schwabenkrieg- oder Bodenseekarte des Monogrammisten PW (PPW) in Kupferlichtdruck. Hrsg. : Internationale Chalkographische Gesellschaft - International Chalcographical Society - SociÃ©tÃ© Internationale Chalcographique. [Berlin, Reichsdruckerei, ca. 1888]. . Verkleinerter Kupferlichtdruck auf geripptem BÃ¼tten mit der eindrucksvollen Darstellung des Schwabenkrieges von 1499 aus der Vogelschau, geschaffen 1505 von dem Monogrammisten PW (PPW). Im Schwabenkrieg, auch "Schweizerkrieg" oder "Engadiner Krieg" genannt, kÃ¤mpften die Eidgenossenschaft und das Haus Habsburg (mit dem SchwÃ¤bischen Bund als VerbÃ¼ndetem) um die Vorherrschaft im eidgenÃ¶ssisch-habsburgischen Grenzgebiet. Den Konflikt konnten die Eidgenossen militÃ¤risch, doch ohne GebietszuwÃ¤chse gewinnen. Die "sÃ¼dwestorientierte Darstellung mit Vedutencharakter, das Gebiet zwischen Einsiedeln, Rottweil, Salem und Bregenz umfassend" (Archivkatalog des Staatsarchivs St. Gallen), zeigt auf sechs Karten detaillierte Landschaftsdarstellungen und Schlachtenszenen. Die Ãœbersicht zeigt alle sechs Detailkarten im Zusammenhang, sowie den auf Blatt 2 gedruckten lateinischen Text und seine deutsche Ãœbersetzung: "Dis ist der Krich tzwichssen dem Rvmichssen kvnick vnd den Sweitzern vnd ganse lantschaft stet slos vnd dvrfe im Sweitzland vnd eim deil fon Swaben lant vnd wair ein s stait getzeichnit das ist den Sweitz vndworfen das and derich vnd de sprvnck vom Rein vnd Thonaw beide". Wilhelm Bonacker vermutet in seinem Aufsatz "Die sogenannte Bodenseekarte des Meisters PW bzw. PPW vom Jahre 1505" (1954 in "Die Erde 1", S. 29 f.) die Schweizer Seite als Auftraggeber, da bei den militÃ¤rischen Darstellungen stets die Eidgenossen die Oberhand hÃ¤tten. Auch hebt er die QualitÃ¤t der Wiedergabe von Ortschaften und GebÃ¤uden und der Schlachtszenen hervor, konstatiert aber bei den Gebirgen eine eher schematische Darstellung. Die IdentitÃ¤t des Stechers ist nach wie vor nicht geklÃ¤rt. In Passavants "Le peintre graveur" wird er als hervorragender, phantasievoller KÃ¼nstler der oberdeutschen Schule des XV. Jahrhunderts beschrieben, seine Handhabung des Stichels sei "(d')une grande finesse et en maÃ®tre, et son dessin est tr?s caractÃ©ristique, plein de vie et de mouvement". - BlattrÃ¤nder vereinzelt stockfleckig, zwei BlÃ¤tter mit wenigen Stockfleckchen in der Darstellung. - Selten. London: Hodder & Stoughton, 1888. First Edition. Hard Cover. Near Fine/No Dust Jacket. Octavo. Contains a 4 page AUTOGRAPH LETTER SIGNED (ALS) BY J. M. BARRIE tipped in between dedication and contents. 250pp., (2)pp.ads. Bound in dark blue cloth, spine lettering gilt within single gilt ruled border, top edge gilt. Small bookplate of J. Christian Bay, a librarian and authority on rare books, and tiny glasgow booksellers ticket to front pastedown. A very nice, clean bright copy showing no wear to binding. Housed in a custom morocco backed slipcase with chemise. 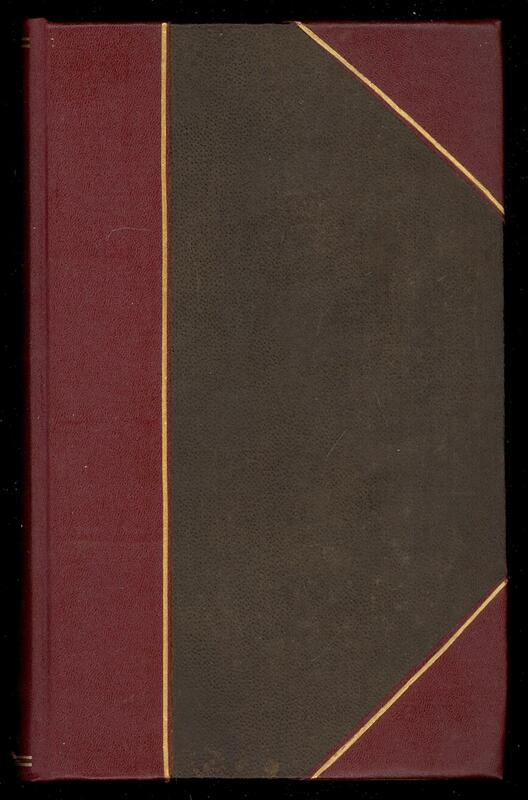 London: MacMillan & Company, 1888. First edition. 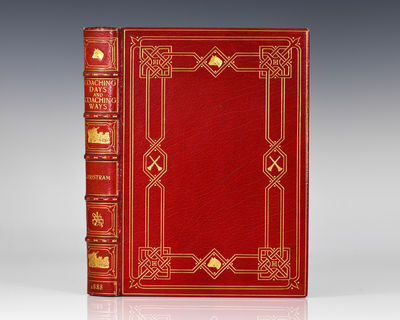 Quarto, ornately bound in full red morocco by Bayntun. 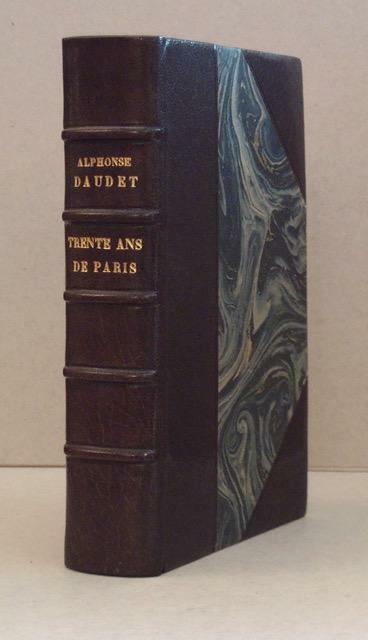 Gilt tooling to the spine, front and rear panels, gilt turn-ins, all edges gilt, marbled endpapers. With the original cloth bound at the rear. Extensively illustrated with drawings by Herbert Railton and Hugh Thomson. From the library of Edward Francis Hutton with his bookplate. Hutton was an American financier and co-founder of E. F. Hutton & Co., one of the most respected financial firms in the United States. Along with his second wife was General Foods heiress, Marjorie Merriweather Post, whom he married in 1920 they built several famous houses including Hillwood, a Tudor revival style mansion on Long Island's North Shore, Mar-a-Lago in Palm Beach, Florida, and the largest privately owned seagoing yacht of the era, the "Hussar V", which is best known as the Sea Cloud. An exceptional presentation with noted provenance. 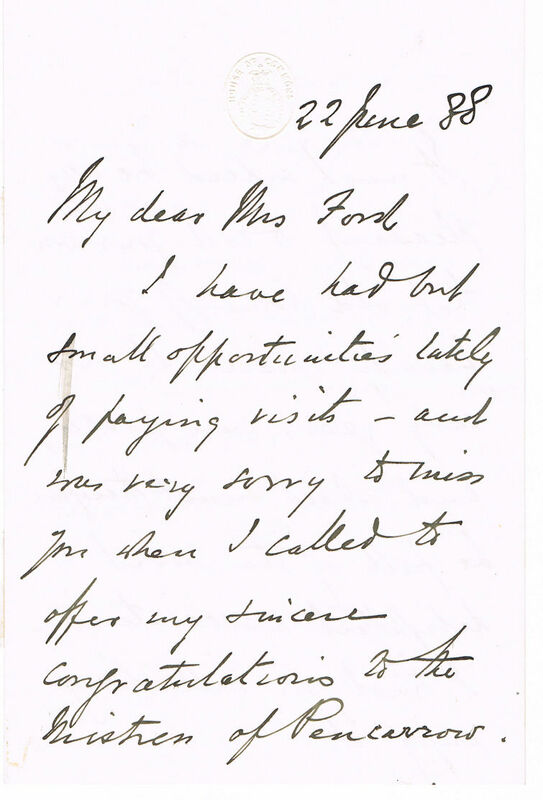 AUTOGRAPH LETTER SIGNED ON HOUSE OF COMMONS LETTERHEAD, and manuscript leaf from his novel "Lady Lee's Widowhood"
NETHERLANDS TOPOGRAPHICAL SURVEY OFFICE (TOPOGRAPHISCHE INRICHTING) / Carel Alphons ECKSTEIN (1840 &#150; 1925). INDONESIA &#150; BESUKI, JAWA TIMUR (EAST JAVA): TOPOGRAPHISCHE KAART DER RESIDENTIE BESOEKI OPGENOMEN INGEVOLGE GOUVERNEMENTS BESLUIT VAN DEN 28STEN MEI 1877 NO. 13, IN DE JAREN 1878-1883. The Hague: Topographische Inrichting 1888 - Chromolithograph, printed on 9 sheets, each sheet 47.5 x 61 cm (19 x 24 inches), that if joined would form a map approximately 160 x 130 cm (63 x 51 inches), housed in original paper wrappers (Very Good, a few closed marginal tears, overall sharp and clean, wrappers with chipped edges re-enforced on verso with archival tape). 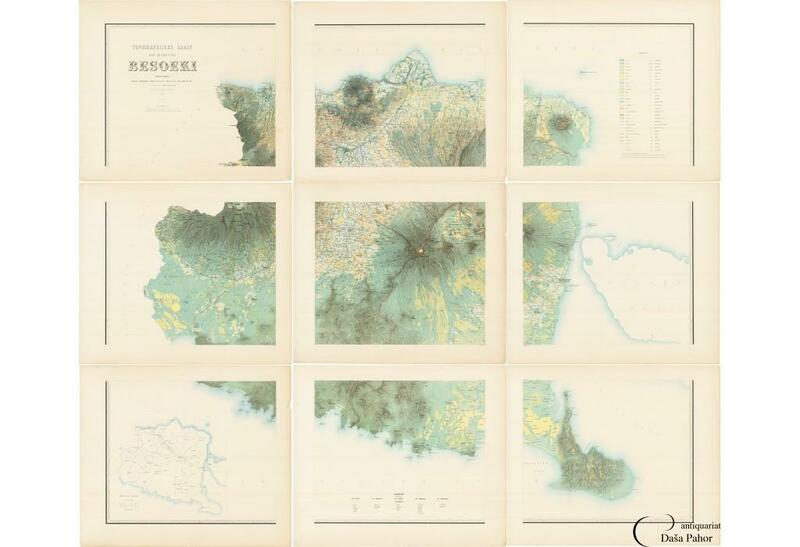 The extremely rare first edition of the spectacular 9-sheet map of Besuki, East Java, from outstanding &#145;Residentiekaarten&#146; series, the product of the Herculean Dutch effort to scientifically survey Java and Madura, printed with a resplendent and award-winning technique of chromolithography. St. Petersburg: Typ. of A.S. Suvorin, 1888. , 78 pp. Octavo. Contemporary green quarter cloth with marbled boards. Upper corner of the last free endpaper cut off and repaired with paper, otherwise a very good copy. First and only edition. Very rare Russian imprint as no copies were found in Worldcat. Interesting eye-witness description of a Russian merchant voyage to the North Pacific and the Arctic Ocean around the Chukotka Peninsula, published as an offprint from the Proceedings of the Russian Geographical Society (vol. XXIV). Resin, an associate of the Governor General of the new Priamyrskoe [Near the Amur River] Governorate (formed in 1884) was assigned to observe and describe its northern regions. In May-September 1885 he joined whaling schooner Sibir' captain planned to reach Wrangel Island, but was forced to turn back by the pack ice. During the return trip the schooner called at the Ratmanov Island (the Diomedes, Bering Strait) and traded there with the Chukchi. On the way to the Providence Bay the ship visited the Tkachen Bay (Chukotka) where the crew picked up a skull of a deceased Chukchi man which was later sent to the Academy of Sciences. 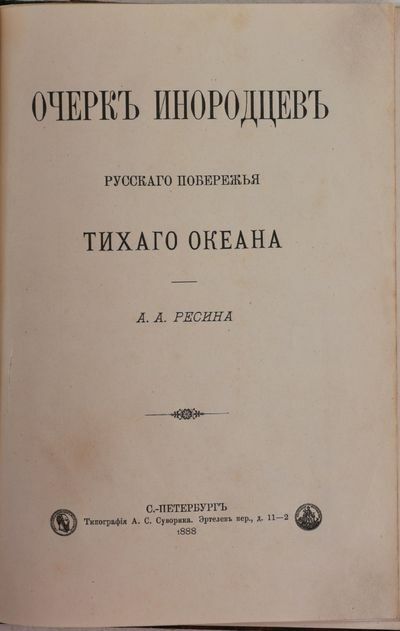 The book describes the voyage from Vladivostok to the Karaga River (Northern Kamchatka) and further north around the Chukotka Peninsula; geography, climate, flora & fauna of Kamchatka, native population of the Petropavlovsk district, and the Gizhiginsky district (''chukmari'' or Kereks, sedentiary Koriaks, Raindeer Koriaks and Chukchi, sedentiary Chukchi). Special part is dedicated to the activities of the Americans near Russian Pacific shores (about 30-35 whaling and trading ships call every year, they hunt whales and walruses, bring rum, Winchester guns, tobacco, gun powder, knives, axes, animal traps, pottery, fabrics etc. ), the author concludes that their influence to the natives is negative and proposes to establish a permanent coast guard at the Kamchatka and Chukotka shores. Pittsburgh: D. C. Williams Press, 1888. 1/2 leather. Very good. Rebound in half-leather. Typewritten. Complete. 361 pages. Sound binding. Clean pages. Light wear. In addition to his diary-memoir, this lot also includes a 233-page family genealogy, Thomas Robinson and his Descendants with entries about him and a 499-page text, Pennsylvania at Chickamauga and Chattanooga: Ceremonies at the Dedication of the Monuments, which contains transcripts of two of Robinson's speeches. 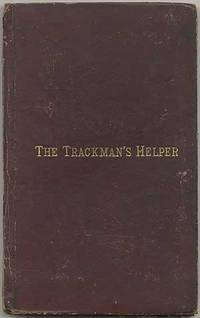 This memoir is built upon an American Civil War diary kept by Robinson, who at various times was a member of the 9th, 73rd, and 77th Pennsylvania Volunteer Regiments. Entries detail the drudgery of military life, countless marches, ever-present sickness and death, battle action, and the life of a prisoner of war. It begins with Robinson's enlistment in the spring of 1861 as a private in the 9th Pennsylvania Volunteers and follows his career, mostly while assigned to the 77th, through to his Brevet Colonel promotion and return from the war in 1866. Robinson participated in the Siege of Corinth and the Battle of Stone River (Murfreesboro). He received a head wound at the Battle of Chickamauga and was taken prisoner after which he was shipped east and confined, first at Richmond's infamous Liberty Prison, then Salisbury, Macon, Charleston, and Columbia. He was eventually paroled, exchanged, and returned to his command. He then led the 77th Regiment in pursuit of Confederate forces throughout Alabama and east Tennessee. After the Army of Virginia surrendered at Appomattox, Robinson and his regiment were reassigned to occupy Texas until January, 1866 when they were returned to Philadelphia and mustered out of the service. Robinson's account is well written and contains some fascinating observations, including: * Upon his commission, Robinson was assigned to the 73rd Infantry which consisted entirely of recent German immigrants; this was done "in order to Americanize them." There he found rations consisted primarily of "lager, pretzels, sauerkraut, rye bread and sweitzer-kase." * At the final assault on Corinth, "They ran like sheep before us. . . . The Army in the night blowing up magazines an burning everything of value. Corinth looks like starvation. . . . We rest. * During the Battle of Stone River, "the 77th was not taken by surprise, as it had been standing at arms since 4 o'clock in the morning and presented at all times an unbroken front to the enemy. In the midst of the battle . . . we formed line after line, being driven back each time, at length . . . a stand was taken and the Enemy was repulsed. . . ." * "What a sad work for us! Was out over the battlefield, and am to-night sick with its scenes of horror. Many have tried to check the flow of blood from their own veins until too weak, then died with their eyes turned toward out lines, vainly wishing for help. . . . " * At Chickamauga we "marched eight miles this morning and went immediately into one of the most desperate battles of the war. . . . Fresh troops were brought up and came rushing upon us and we fought them until 8 P.M. Dark - and no support coming up - they flanked us, and here I am, a prisoner, on my melancholy way to Dixie - sick with chills, and no blanket, - nothing to eat - my haversack, sword and belt taken from me. His recounting of the bleakness of prison life is riveting in its concise despair. * We receive "1/2 loaf of bread and six oz. of meat a day. . . . Without blanket . . . 'Tis very cold. Must walk to keep warm. . . . Nothing to eat. . . Nothing to wear. . . No stool to sit upon. Must squat. . . . Time hangs heavy." * "Six hundred men in a small yard with no shade. . . . All of the filth and garbage of the prison is thrown out among us. Words can't describe the miserable condition we are in here. . . . Corn bread for two men . . . the size of half a brick, and indigestible. Horrible stuff. . . ." * "Today has been as yesterday, only more abundant in its ennui. . . . The C.S.A. is rotten and it stinks. . . . Beef and pork are played out, and we mourn our daily dish of soup. . . . Sweet potatoes are issued in place of meat." * "Our men from Belle Isle passed the prison to-day. A sad sight! Many of them unable to walk alone - leaning upon their comrades - literally starved, - dirty ghastly, thin legs and arms. Poor fellows! We pay back ten-fold." Quite scarce. As of 2017, OCLC locates only one other example at the John Heinz History Center in Ohio. None in the trade and no auction records at ABPC or the Rare Book Hub. London: Kegan Paul, Trench, & Co. 1888 - first edition; 2 vols., xv, 447, 32 (publisher's catalogue) + vii, 492 pp., folding map; original red-stamped blue cloth, head of spine of the second volume is chipped with some loss, small hand stamp to title pages, text unopened, else a very good set. Photos available upon request. Wissenschaftliche Luftfahrten. Ausgeführt vom Deutschen Verein zur Förderung der Luftschiffahrt in Berlin. 1. 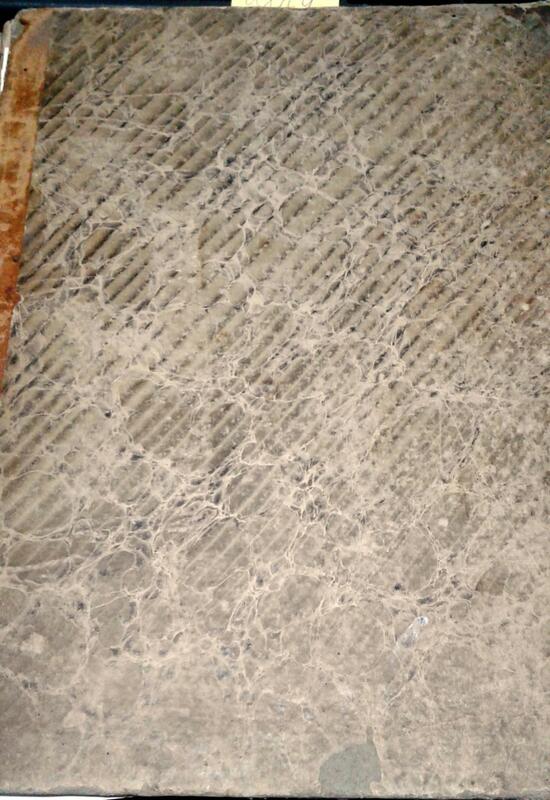 Geschichte und Beobachtungsmaterial 2. Beschreibung und Ergebnisse der einzelnen Fahrten 3. Zusammenfassung und Hauptergebnisse. 3 Bände., Mit zus. 1 chromolith. Frontispiz, 5 farb. lith. Tafeln, 4 weiteren Tafeln, 349 Textabbildungen und 59 Karten. Gering berieben und bestoßen Kanten leicht beschabt Vorderdeckel von Band 2 mit sehr schwachem Fleck und hinterer Deckel dieses Bandes mit winziger Bezugspapierläsur Vorderdeckel von Band 3 am Kopf im Bereich des Rückens leicht verblasst - insgesamt ein sehr schönes Exemplar des monumentalen Werkes. Bedeutende Dokumentation über die erste systematische Untersuchung der höheren Luftschichten. Insgesamt werden 75 seit dem Jahr 1888 erfolgte Ballonfahrten analysiert. Der erste Band enthält eine Geschichte der wissenschaftlichen Luftfahrten seit dem Jahr 1783 (S. 1-136). Beiträge von Richard Assmann, Hans Gross, Arthur Berson, Victor Kremser, Richard Börnstein, Otto Baschin, Reinhard Süring und Wilhelm von Bezold. Brockett I, 949.
um 1888 Teil I. Lieferung I - XIII, 72 ganz- oder doppelseitige Kunstblätter, Teil II. Skizzen, Studien, Zeitillustrationen und Portraits (div. Textillustrationen), Teil III. Erzählungen und Novellen, Teil IV. Grössere illustrierte Aufsätze, Teil V. Gedichte und Aphorismen reich dek. Einbd. (Ln mit Vierfarbendruck und Goldprägung), marm. Schnitt, Seidenhemdchen (teilw. zerknittert und braunfleckig), Gilb, Vorsatz mit Ausfärbung des Einbands, außen geringf. berieben, sehr schönes Ex.! - Paul Ollendorff, Paris 1888, In-12 (12,5x19cm), 322pp., relié. 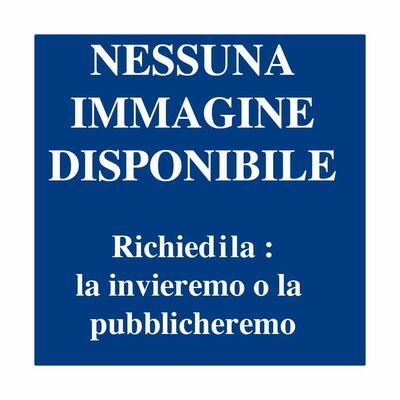 - Edizione per la quale è stato girato 10 copie numerate di lusso. Binding metà marocco con angoli di cacao epoca. Torna nervi giansenisti. testa dorata. Reti sulle stoviglie. coperture conservati. Leggermente indietro e in modo uniforme assottigliato. Tracce di attrito (mascelle, cunei, piatti). - [FRENCH VERSION FOLLOWS] Edition originale pour laquelle il a été tiré 10 exemplaires de luxe numérotés. Reliure en demi maroquin à coins d'époque cacao. Dos à nerfs janséniste. Tête dorée. Filets sur les plats. Couvertures conservées. Dos légèrement et uniformément éclairci. Traces de frottements (mors, coins, plats, coiffes). Sobre et bel exemplaire. 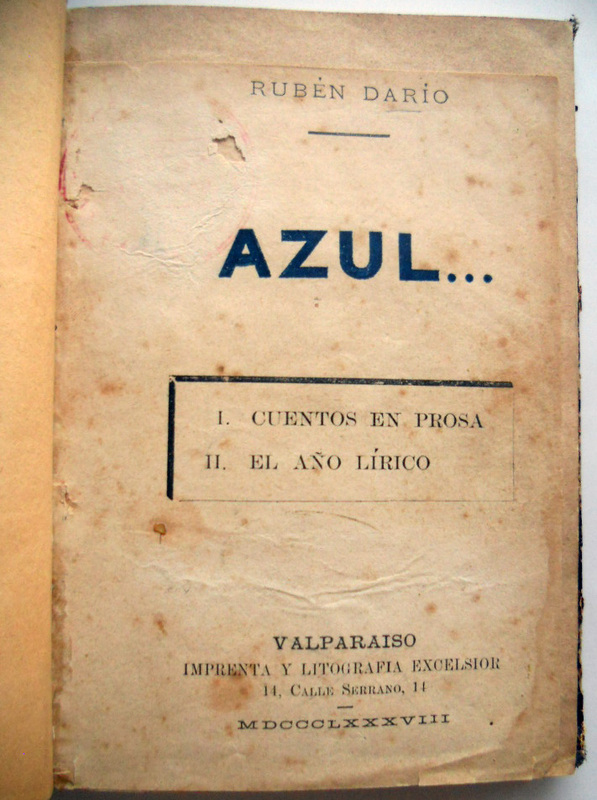 Azul. (I. Cuentos en prosa - II. El año lírico). 25 x 16. Each volume ca. 400 pp. Contemporary halfcloth bindings (vol. VI in later cloth). *Eine Zeitschrift über Geschichte und Kultur der Zigeuner. Eine erste Serie erschien 1888-1892 in 3 Bänden. erst 1907 folgte nach 15-jähriger Pause eine Neue Serie (9 Bände 1907-1916). Die Zeitschrift erscheint (in der 4. Serie) bis heute. Vorliegend die ersten 6 Bände der neuen Serie in den Originalausgaben, erschienen in kleiner Auflage nur für die Mitglieder der Organisation. - Die broschierten Orig.-Umschläge meist mit eingebunden. Bei 2 Bänden mit Abfärbung vom Buchschnitt auf das Frontispiz. Insgesamt gut erhaltene Bibliotheksdublette, Titelblatt rückseitig mit entwertetem Stempel. / A yearbook for the history and culture of the gypsy. 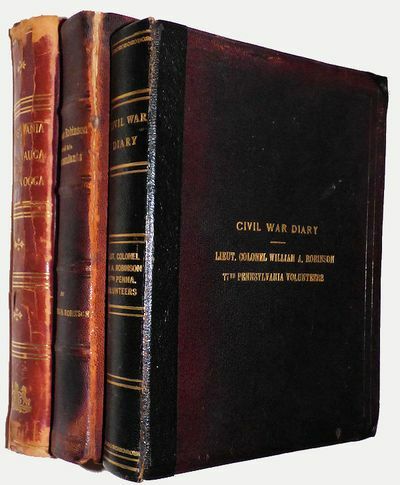 1888-1892 appeared a first series in 3 volumes. The organisation was inactiv 1893-1907. 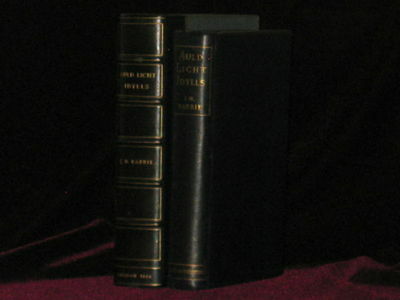 A second series appeared 1907-1916 in 9 vols. - Here are present the first 6 volumes of the second series in original editions. 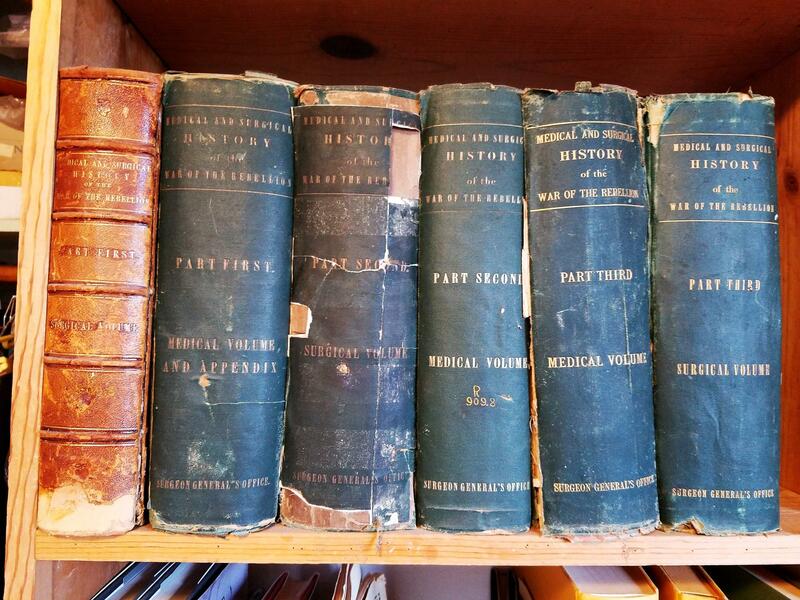 - In all well preserved library copies: Titles recto with old stamp. In 2 volumes the frontispiece with discoloring from the edges. Orig. wrappers mostly bound in. Oeuvres : théorie analytique de la chaleur, mémoires publiés dans divers recueils (2 volumes). 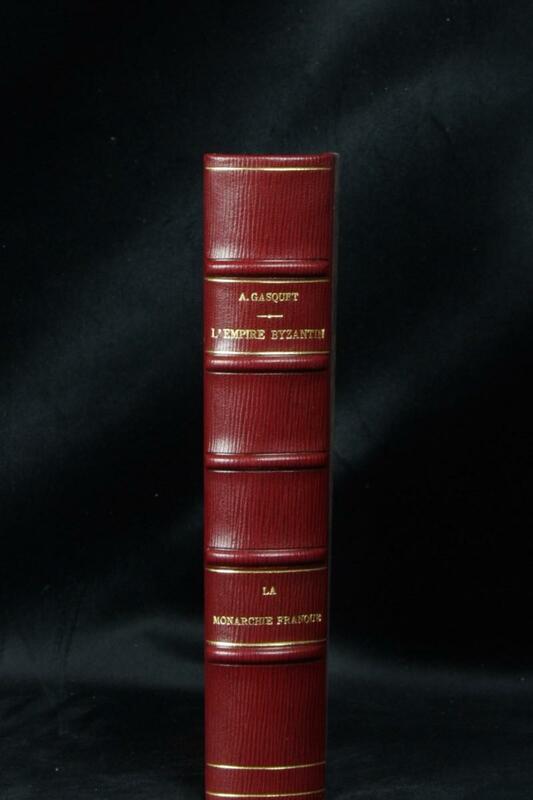 Gauthier-Villars, 2 volumes, 1888-1890, 563-633 pp., demi-chagrin, environ 27x22cm, dos et mors frottés, coins émoussés, un feuillet détaché à la fin du premier volume (sans manque), premiers mors fendu à l'intérieur, intérieurs propres.Merci de nous contacter à l'avance si vous souhaitez consulter une référence au sein de notre librairie. South Africa. Illustrated by a series of one hundred and four permanent Photographs. 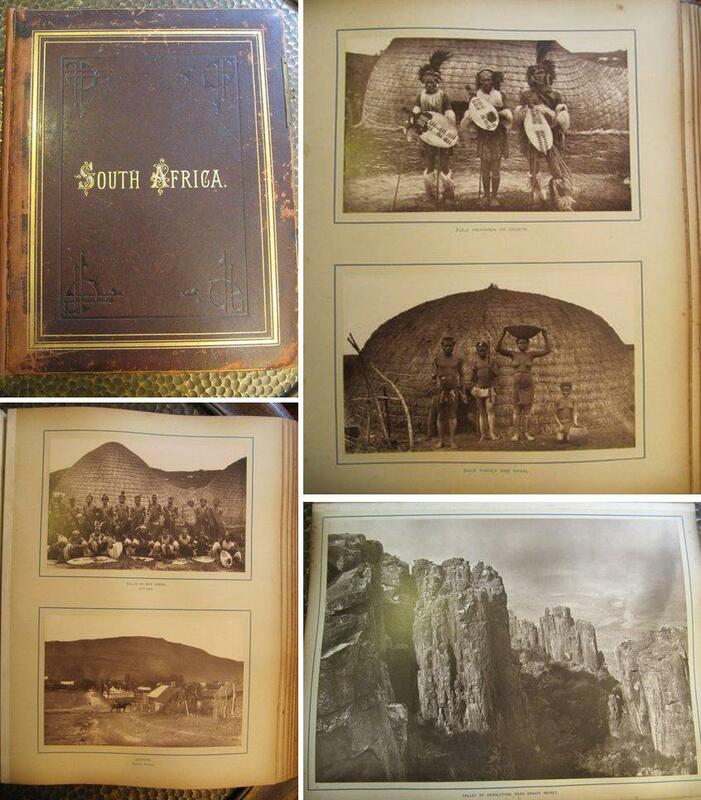 Published by the Author, Port Elizabeth, 1888. - EA. Mit 107 (!) aufgewalzten Fotografien in Lichtdruck (statt 104, wie im Titel und im Vorwort angegeben), 5 davon in 32,5 x 23,3cm, 102 davon in 19 x 12,5cm. Dekorativer Original-Ganzleder-Einband mit Deckel- und Rücken-Goldprägung sowie Resten einer Metall-Schließe, schwere Vorsatzblätter in Moire-Effekt, Goldschnitt. Eingeleitet von 4 Seiten Text. Folio-Format 37,5 x 30,5 cm. Einband berieben, Rücken sorgfältig restauriert mit aufgezogenem Original-Rücken. Innen teils gering stockfleckig, Fotografien nicht betroffen. Guter Zustand. Ein Kaleidoskop des damaligen Südafrika mit Ansichten von Städten, Häusern, Landschaften, Arbeitern, Minen, Ureinwohnern. Zahlreiche Fotos von enormer Brillianz und Tiefenschärfe. Selten , vermutl. einmalig mit 107 Fotografien. Autograph letter signed ("P. Verlaine" and "P. V."). Paris, 9. IV. 1888. 1888. 8vo. 2 2/3 pp. on bifolium. To an unnamed addressee whose beautiful book he has read with much pleasure. Allgemeine Maschinenlehre. Ein Leitfaden für Vorträge, sowie zum Selbststudium des heutigen Maschinenwesens, mit besonderer Berücksichtigung seiner Entwicklung. Für angehende Techniker, Cameralisten, Landwirthe und Gebildete jeden Standes. 4 Bände. Zus. ca. 5000 Seiten mit ca. 2500 teils blattgroßen Textholzstichen und einigen Tafeln. Halbleinenbände der Zeit mit Rückentitel (Rücken leicht verblasst). *Umfangreiches systematisches Kompendium zum Maschinenbau im späten 19. Jahrhundert, eine reich illustrierte zeitgenössische Fundgrube über alle Sparten und Arten von Maschinen. Bände 1-4 erschienen bis 1888 von Rühlmann, ein fünfter Band wurde erst 1902 von Osw. Flamm beendet. - Band 1: Maschinen zum Messen und Zählen / Maschinen zur Aufnahme der Menschen- und Tierkräfte. Wasserräder, Windräder Dampfmaschinen, Luftmaschinen. - Band 2: Mühlen und landwirtschaftliche Maschinen (auch Locomobile und transportable Dampfmaschinen). - Band 3: Straßen- und Eisenbahnfuhrwerke, einschl. Lokomotiven, Dampf-Omnibusse, Maschinen und Apparate für pneumatischen Transport. - Band 4: Maschinen zur Ortsveränderung, Heb- und Senkmaschinen, Ramm-Maschinen, Bagger, Pumpen, Kompressoren, Transmission. - 5. Band: Geschichte der Ruder-, Segel- und Dampfschiffe. Practischer Schiffbau. Entwerfen von Schiffen. Theorie des Schiffes. Schiffskessel und Schiffsmaschinen. - Titelblätter rückseitig gestempelt, sonst durchweg sauber und gut erhalten. leicht schief, Einband an den Kanten abgegriffen, gebräunt, Inhalt:Erstes Buch: DER GÖTZE KULTUR:Der Zusammenprall- Die Durchdringung- Die eiserne Wand- Der Wurf- Die Ringwellen fluten zurückZweites Buch: SCHACH DEM KREISLAUF Der Aufmarsch- Maschinen und Brücken- Das Gehirn- Der Sieg- Das neue Fragezeichen"Egmont Colerus von Geldern (1888- 1939) war ein österreichischer Schriftsteller. Colerus von Geldern stammte aus einer alten niederländischen Offiziersfamilie, die um 1750 aus Holland nach Österreich eingewandert war. .. 1920 veröffentlichte Colerus seine ersten beiden Bücher - Antarktis, das er bereits 1914, sowie Sodom, das er 1917 bis 1919 verfasst hatte. Als Colerus nach zwei Jahren wieder halbwegs arbeitsfähig war, trat er im Herbst 1921 hauptberuflich als Beamter ins österreichische Bundesamt für Statistik ein, die heutige Statistik Austria. In dieser Zeit verfasste er weitere historische Romane, Sachbücher und auch Dramen. Seine Bücher schrieb er großteils in der Nacht, üblicherweise zwischen zehn Uhr und Mitternacht. 1930 wurde seine Tochter Monica geboren dieses Ereignis spiegelt sich in seinem Roman Matthias Werner im letzten Kapitel Das Gebet an der Wiege, das auch eine Vision des Zweiten Weltkriegs enthält. Ein von Walther Neugebauer geleiteter Kurs für höhere und statistische Mathematik, den er am Bundesamt für Statistik besuchte, erweckte in ihm die Liebe zur Mathematik. Um "die Abscheu vor der reinsten, fast möchte ich sagen, heiligsten aller Wissenschaften" zu bekämpfen, schrieb er seine populärwissenschaftlichen mathematischen Sachbücher "Vom Einmaleins zum Integral", "Vom Punkt zur vierten Dimension" und "Von Pythagoras bis Hilbert", die in mehrere Sprachen übersetzt wurden und auch heute noch für den mathematisch interessierten Laien sehr lesenswert sind.....Colerus behandelte in seinen Romanen aus einer zutiefst humanistischen Weltsicht in impressionistischer, teilweise auch expressionistischer Art vielfältige Problemstellungen der Zwischenkriegszeit, teils in der Form von Zeitromanen, teils in historischer Einkleidung. Er zählte damit in der Zwischenkriegszeit zu den erfolgreichsten deutschen Schriftstellern (Gesamtauflage über 670.000 Exemplare), einzelne seiner Werke wurden in bis zu zehn Sprachen übersetzt." aus wikipedia Wir danken unseren Kunden/Kundinnen und Kollegen/Kolleginnen für ein schönes Jahr 2016. Und wünschen ALLEN ein gutes neues Jahr 2017. Mitchell, Dakota: Joseph Kindelan, Roadmaster / The Mitchell Printing Co.. (1888). First. First edition. Small octavo. 299pp. ; 5pp. of ads. Red paper gilt over boards. Small publisher's label front pastedown, modest rubbing at the extremities, a nice, very good copy. 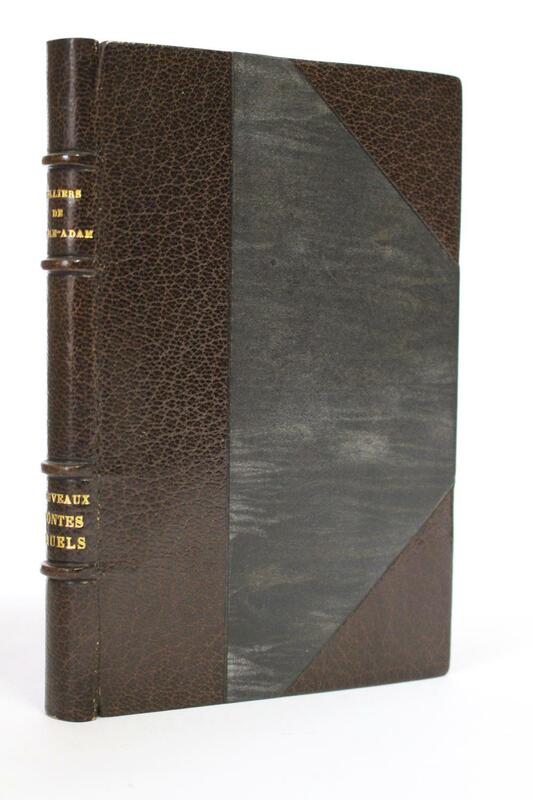 OCLC locates about six copies of the Dakota edition over two records. . 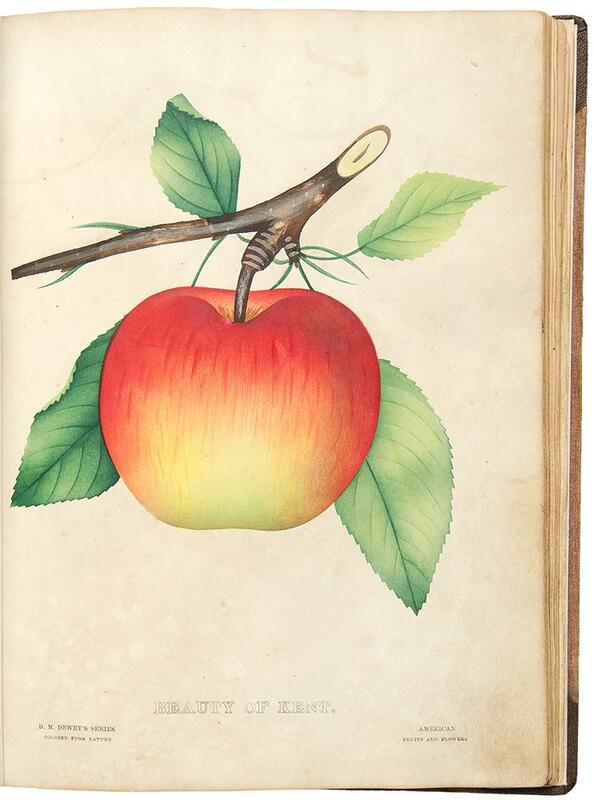 The Nurseryman's Specimen Book of American Fruits, Flowers, Ornamental Trees, Shrubs, Roses &c. Rochester Lithographing Company, successors to D. M. Dewey's American Fruit & Flower Plates . Africa. No. 7 (1888). Reports on Slave Trade on the East Coast of Africa: 1887-88. Presented to both Houses of Parliament by command of Her Majesty. November 1888. [C.-5578]. London, printed for Her Majesty's Stationery Office, by Harrison and Sons, 1888. 1888. Folio. IV, 87, (1) pp. Sewn, with remains of former spine. Rare British parliamentary papers and correspondence with local agents and officers on the slave trade, including reports of naval battles with dhows (often flying false French colours) between the east coast of Africa and Jeddah, as well as a report on British activity in the Arabian Gulf which halted the slave trade on the northern shore of the Peninsula: "the strict blockade which has been established on the Arabian coast during the past two seasons has to a great extent stopped the transport of cargoes of slaves in large numbers from Africa to the Arabian coast and the Persian Gulf" (p. 3). - A good copy. Not in Bennett, but cf. his no. 519, noting Parliamentary Paper C.-5575, possibly in error. Die Loango-Expedition. Dritte Abtheilung, erste und zweite Hälfte. (In einem Band). Nouveau Plan de la Ville de Bordeaux A L'Usage des Promeneurs Par Alfred Lapierre [with] Tableau des Voies de la Ville de Bordeaux et de la Banlieue. Feret & Fils, 1888 - An attractive plan of Bordeaux Lithographed map with original full colour, dissected and laid on linen, folding into original red cloth covers, lettered and tooled in gilt [with] accompanying printed booklet, some black and red ink staining to front cover. A map of the city of Bordeaux. Bordeaux had enjoyed an architectural renaissance over the late eighteenth and early nineteenth centuries, fuelled by wine exports. 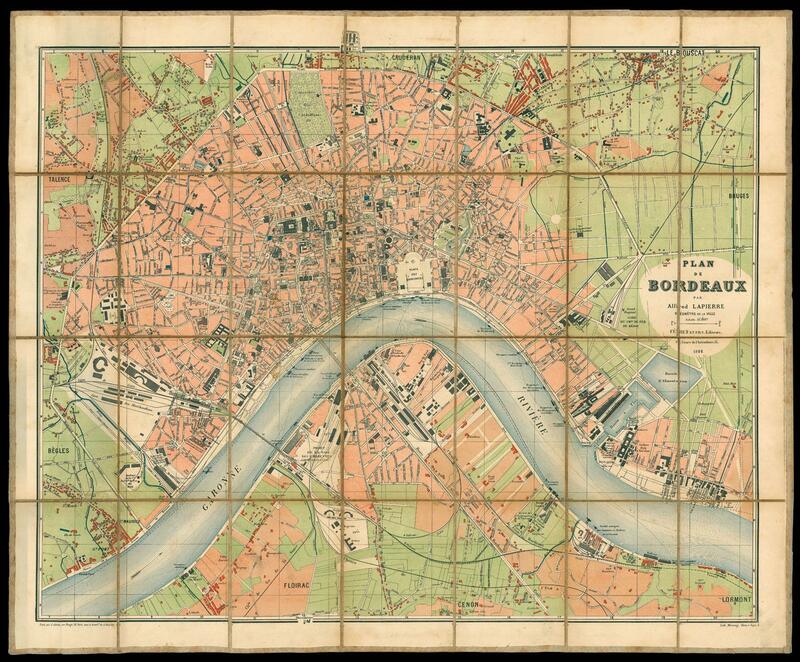 The map was made thirty years after the first official classification of Bordeaux wines, initiated by the Emperor Napoleon III, and viniculture remained the economic backbone of the region. The accompanying booklet contains a list of street names both in Bordeaux and in the suburbs and their location on the map, a list of industrial and government buildings, and adverts for local businesses. 565 by 710mm. (22.25 by 28 inches). Bologna, Tip. Azzoguidi, 1888, due vol. in-folio, br. originale, pp. 120 + tavole 1/60 (ma 13a doppia e 54/60 sono in due sole carte). Manca la tav. XI. Der Leviathan in der Staatslehre des Thomas Hobbes. Sinn und Fehlschlag eines politischen Symbols. 132 S. OLwd. OU. Seltene erste Ausgabe. (Umschlag mit hinterlegten Randläsuren und kleinen Einrissen, sonst gut) [Carl Schmitt (zeitweise auch Carl Schmitt-Dorotic)[ (* 11. Juli 1888 in Plettenberg 7. April 1985 ebenda) war ein deutscher Staatsrechtler, der auch als politischer Philosoph rezipiert wird. Er ist einer der bekanntesten, wenn auch umstrittensten deutschen Staats- und Völkerrechtler des 20. Jahrhunderts. Als Kronjurist des Dritten Reiches (Waldemar Gurian) galt Schmitt nach 1945 als kompromittiert. Sein im Katholizismus verwurzeltes Denken kreiste um Fragen der Macht, der Gewalt und der Rechtsverwirklichung. Neben dem Staats- und Verfassungsrecht streifen seine Veröffentlichungen zahlreiche weitere Disziplinen wie Politikwissenschaft, Soziologie, Theologie, Germanistik und Philosophie. Sein breitgespanntes uvre umfasst außer juristischen und politischen Arbeiten verschiedene weitere Textgattungen, etwa Satiren, Reisenotizen, ideengeschichtliche Untersuchungen oder germanistische Textexegesen. Als Jurist prägte er eine Reihe von Begriffen und Konzepten, die in den wissenschaftlichen, politischen und sogar allgemeinen Sprachgebrauch eingegangen sind, etwa Verfassungswirklichkeit, Politische Theologie, Freund-/Feind-Unterscheidung oder dilatorischer Formelkompromiss. Schmitt wird heute zwar vor allem wegen seines staatsrechtlichen Einsatzes für den Nationalsozialismus als furchtbarer Jurist, umstrittener Theoretiker und Gegner der liberalen Demokratie gescholten, zugleich aber auch als Klassiker des politischen Denkens (Herfried Münkler) gewürdigt nicht zuletzt aufgrund seiner Wirkung auf das Staatsrecht und die Rechtswissenschaft der frühen Bundesrepublik. Die prägenden Einflüsse für sein Denken bezog Schmitt von politischen Philosophen und Staatsdenkern wie Thomas Hobbes, Niccolò Machiavelli, Aristoteles,] Jean-Jacques Rousseau, Juan Donoso Cortés oder Zeitgenossen wie Georges Sorel und Vilfredo Pareto. (Wikipedia) Ich versende mit der Deutschen Post (Büchersendung) und der DHL (Pakete). Die Lieferzeit ist abhängig von der Versandart und beträgt innerhalb Deutschlands 3-5 Tage, in der EU 5 - 14 Tage. <p>DSB X: 442; Kannenberg, Introduction to the English translation, <em>Geometric Calculus â€“ According to the Ausdehnungslehre of H. Grassmann</em>, 2000; Kennedy, <em>Peano</em>: <em>Life and Work</em><em> of Giuseppe Peano</em>, 1980; Van Heijenoort: <em>From Frege to GÃ¶del. 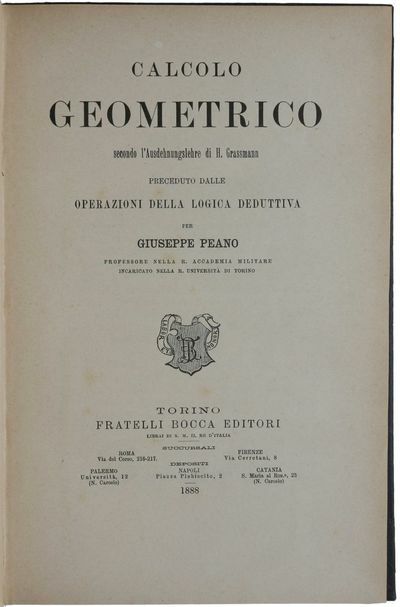 A Source Book in Mathematical Logic, 1879-1931</em>.</p> 8vo (237 x 156 mm), pp. x, [ii], 170, . 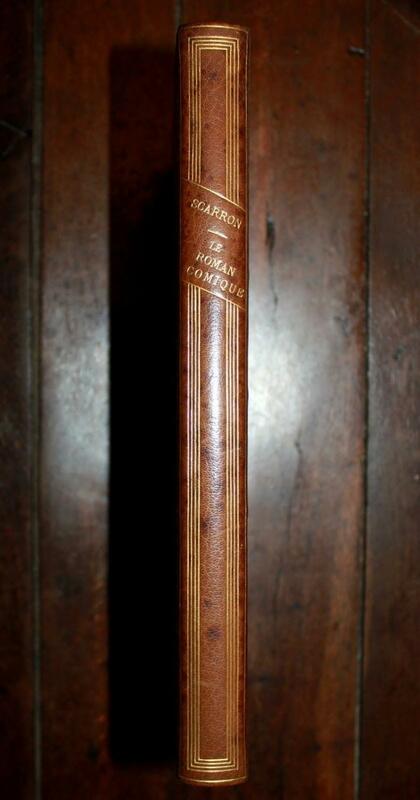 Contemporary half cloth, manuscript title label to spine, a very fine and clean copy. Die Burgen in Elsass-Lothringen. Ein Beitrag zur Kenntnis der Militär-Architectur des Mittelalters. 1. Heft: Die Burgen im Unter-Elsass. 2. Heft: Die Burgen in Lothringen. Mit zus. 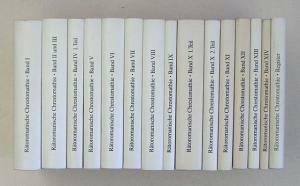 15 doppelblattgroßen lithographierten Tafeln. 27 x 20 cm. I. 32 Seiten, 9 Tafeln. - II. 13 Seiten, 6 Tafeln. Etwas späterer broschierter Umschlag. *Originalausgabe. - Vorwort am Ende mit mehrzeiligem handschriftlichem Eintrag des Verfassers, und dessen Signatur, datiert "Straßburg 1888". - Die Tafeln zeigen in Heft I: Fleckenstein - Schoeneck - Lichtenberg - Hoh-Barr - Dagsburg - Burg Bernstein - Odilienberg - Landsberg - Hoh-Andlau und Speburg bei Barr - Hohkönigsburg und die Rapolsweiler Schlösser. 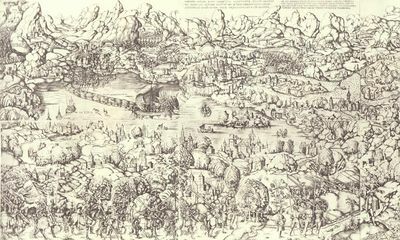 - Heft II: Hunaweier, Reichenweier, Reichenstein, Kienzheim und Kaysersberg - Die Frankenburg, die drei Egisheimer Schlösser und der Hohlandsberg - Die Hohnack, das Oel-Thor in Türkheim, der Hugstein die Egisheimer Pfalz. - Engelsburg, Hirzenstein, Herrenfluth und die Stadttütmer von Sennheim und Ruffach - Die Burgen des Sundgaues: Pfirt, Liebenstein, Moersperg und Landskron - Die Burgen Rodemachern und Sierk in Lothringen. - Insgesamt sauber und gut erhalten. Fanfare. Gewidmet dem Protector des Wiener Schützenvereines von der aus Mitgliedern des Vereines gebildeten Waldhornisten-Abtheilung. [Wohl Wien], 1888. 1888. Eigenh. Musikmanuskript. 1 S. auf gefalt. Doppelblatt (farblithogr. Notenpapier mit Schmuckbordüre). Einliegend in Kartonmappe, diese mit goldener Brokatschnur gehalten in prächtigem historistischem Lederband über Holzdeckeln mit reicher Reliefprägung, breitem Rahmen mit vergoldeter Blattwerksbordüre, Messing-Eckbeschlägen, aufwendiger Goldprägung und Wappenauflage im Mittelfeld (auf blecherner Wappenkartusche ziselierte Messingauflage mit emailliertem Wappen der Stadt Wien und Umschrift "Wiener Schützen-Verein"). Die Innendeckel und die den Kartonfalz mit dem Manuskript umfassende Innenmappe mit preußischblauem Seidenbezug; die Mappe mit dem o. a. Titel in Goldprägung (innen mit weißem Papier mit Moiréeprägung bezogen). Folio (290:390 mm). Prächtig gebundenes, beschädigtes Dedikations-Musikmanuskript für die Waldhorn-Corps des Wiener Schützenvereins. Aus der Buchbinderei F. W. Papke im 4. Wiener Gemeindebezirk (am Vorderdeckel signiert). Noch 1914 führt "Lehmann's Allgemeiner Wohnungs-Anzeiger nebst Handels- und Gewerbe-Adreßbuch Wien" den Eintrag: "Papke F. W. - Buchbinderei und Musterkarten Fabrikation Specialität: Feine Liebhaber-Einbände, sowie künstlerisch vollendete Bucheinbände, Überreichungs-Adressen, Albums Portemonnaie-Kalender, Poesiebücher, Schreibmappen-Fabrikation. Permanente Ausstellung in den Salons im I. und II. Stock, Wien IV Wieden Mozartplatz neben Johann Strauß-Theater, Niederlage IV Wiedner Hauptstraße 15-17, Habighof". - Beiliegend 2 zeitgenöss. Eintrittskarten: eine unausgefüllte "Einlass-Karte zum Schützen-Zeit 1855 für Herrn ..." sowie eine "für Herrn Ahlen" ausgefüllte "Einlass-Karte" ins "Zelt der Vten Comp.". - Rücken gebrochen und restaurierungsbedürftig; Blätter mit unschönen Knickspuren. Emin Pascha, eine Sammlung von Reisebriefen und Berichten Dr. Emin- Paschas aus den ehemals ägyptischen Aequatorialprovinzen und deren Grenzländern, herausgegeben mit Unterstützung von Robert Felkin und Gustav Hartlaub Mit Portrait, Lebensskizze und erklärendem Namensverzeichnis. 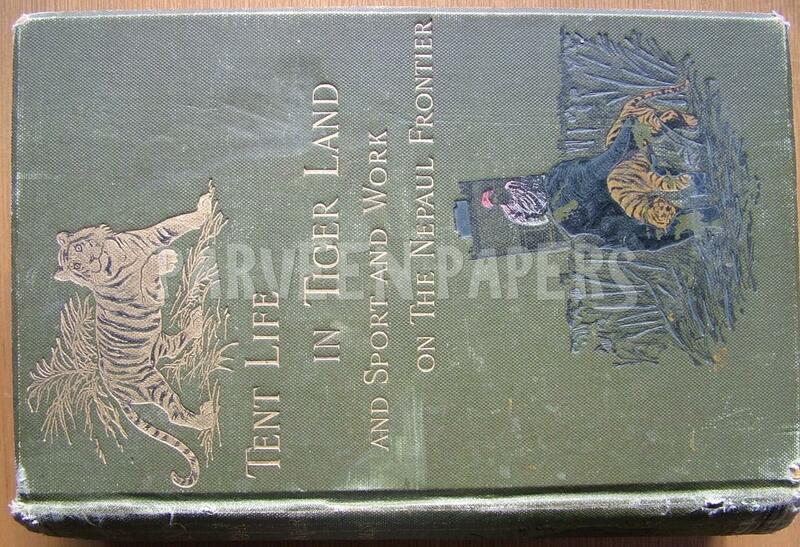 Tent Life in Tiger Land and Sport and Work on the Nepaul Frontier. Gr.-8, ca. 8000 S., OLwd. m OU., Tadell. Die Rätoromanische Chrestomathie von Caspar Decurtins ist die bis heute wichtigste Textsammlung des Bündnerromanischen. Die insgesamt rund 8000 Seiten enthalten Texte der verschiedensten Gattungen über einen Zeitraum von vier Jahrhunderten, aus allen Regionen und in allen Idiomen des Bündnerromanischen. Die heute wichtigste Textsammlung (EA 1888-96) auf Rätoromanisch wurde zwischen 1982 und 1986 vom Churer Verleger Andreas Joos zusammen mit der Società Retorumantscha als 13-teilige Buchreihe neu herausgegeben und durch einen 14. und 15. Band ergänzt. 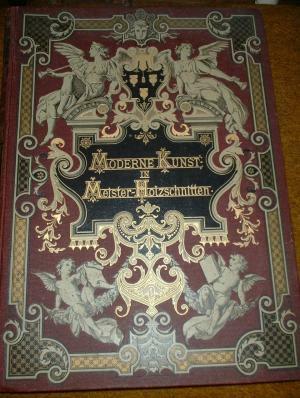 - Caspar Decurtins (1855-1916), auch Löwe von Trun genannt, Politiker (Katholisch-Konservativ) aus dem Surselva, studierte Decurtins nach 1875 Geschichte, Kunstgeschichte und Staatsrecht in München und Heidelberg, ab 1877 wieder in Graubünden. Als Landammann der Cadi führte Decurtins nach 1877 zusammen mit Placi Condrau die Restaurierung des Klosters Disentis durch. Er schaltete die politische Konkurrenz der Katholisch-Liberalen in der Surselva aus und wurde die treibende Kraft hinter der Lavina naira. In den 1890er Jahren schmolz seine Wählerbasis im Kanton zunehmend und Decurtins zog sich enttäuscht aus der Politik zurück. Im Jahr 1889 hatte Decurtins an der Gründung der Universität Freiburg durch seinen Studienfreund Georges Python entscheidenden Anteil. Von 1905 bis 1913 unterrichtete er als Professor für Kulturgeschichte an der dortigen Philosophischen Fakultät. Grosses Kampfspiel des Jean Dupuis im Ringen mit zwei starken Männern, Namens Rotloff aus Chemnitz, in Diensten bei der Gasbeleuchtung und einem Ungenannten aus Leipzig. (Unterzeichner:) Quirin Müller & Jean Dupuis & Co.
Plakat mit Holzschnitt (17 x 20 cm), eine Ringerszene darstellend. Blattgr. : 52 x 46 cm. Jean Dupuis beschreibt hier umfangreich die Regeln und nennt den ausgesetzten Preis von 500 Thalern, der demjenigen zugestanden wird, der Dupuis auf den Rücken werfen kann. Das habe allerding noch niemand vollbracht zumindest sichert der Ringer jedem Wagemutigen zu, "daß ihnen nichts Uebles widerfahren wird. - Das Artisten-Lexikon des Saltarino (S. 54) zeichnet das Leben des bemerkenswerten Mannes aus Marseille nach, der 1888 im Alter von 97 Jahren in Württemberg starb. - Mit Faltspuren, Ränder tls. etwas knittrig. Plakat mit Holzschnitt (17 x 19.5 cm), eine Ringerszene darstellend. Blattgr. : 46 x 44 cm. Jean Dupuis beschreibt hier umfangreich die Regeln und nennt den ausgesetzten Preis von 500 Thalern, der demjenigen zugestanden wird, der Dupuis auf den Rücken werfen kann. Das habe allerding noch niemand vollbracht zumindest sichert der Ringer jedem Wagemutigen zu, "daß ihnen nichts Uebles widerfahren wird. - Das Artisten-Lexikon des Saltarino (S. 54) zeichnet das Leben des bemerkenswerten Mannes aus Marseille nach, der 1888 im Alter von 97 Jahren in Württemberg starb. - Unten wohl mit etwas Textverlust (Druckerangabe) beschnitten. Tls. stockfleckig, mit kl. Hinterlegung.